Today's APOD is an Extra Detail Magnification (or "EDM", for short) of the Eastern Side of the Comet 67P/Churyumov-Gerasimenko, and it shows us what appears to be a huge and highly irregularly-shaped Crater-like Surface Formation (quite similar, in a way, to the Stickney Crater that, as you know, is located on the Martian moon Phobos). This crop has been obtained from a larger picture of the Comet 67P/Churyumov-Gerasimenko's Nucleus, as seen by the European Space Agency's (or "ESA", for short) Rosetta Spaceccraft OSIRIS Narrow-Angle Camera on August 3, 2014. The original full picture was taken from a distance of about 177 miles (such as approx. 284,85 Km) from this fascinating and highly unusually-looking Celestial Body. In fact, as you can see for yourself in yesterday's APOD, the curious Double-Lobed Shape of the Cometary Nucleus is revealed in amazing detail (consider that the image resolution is, roughly, only 17 feet - such as approx. 5,1816 meters - per pixel). About 4 Km (such as approx. 2,484 miles) across, the Comet Nucleus is presently just over 400 Million KiloMeters (meaning approx. 248.400.000 miles) from our Home Planet Earth, and precisely in-between the orbits of Jupiter and Mars. Now Rosetta, the first Spacecraft capable to achieve a delicate orbit around a Comet, will swing up to within approx. 50 Km (about 31,05 miles) from the Comet's Surface and then even closer to 67P/Churyumov-Gerasimenko in the coming weeks, in order to identify a few candidate sites for the landing of its Probe, "Philae" (an extremely difficult and hazardous landing which shall occur later this year). 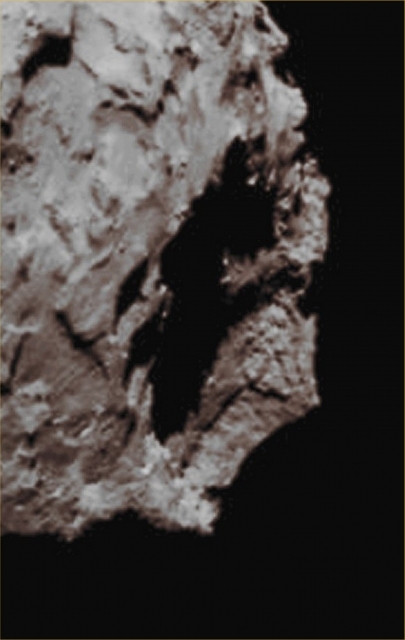 This frame (which is a crop taken from an Original ESA - Rosetta Spacecraft's b/w and NON Map-Projected image published on the NASA - Planetary Photojournal with the ID n. PIA 18641) has been additionally processed, contrast enhanced, magnified to aid the visibility of the details, Gamma corrected and then colorized - according to an educated guess (or, if you wish, an informed speculation) carried out by Dr Paolo C. Fienga - in Absolute Natural Colors (such as the colors that a human eye would actually perceive if someone were onboard the ESA - Rosetta Spacecraft and then looked outside, towards the Comet 67P/Churyumov-Gerasimenko) by using an original technique created - and, in time, dramatically improved - by the Lunar Explorer Italia Team. Different colors, as well as different shades of the same color, mean, among other things, the existence of different Elements (Minerals) present on the Surface of the Comet 67P/Churyumov-Gerasimenko, each having a different Albedo (---> Reflectivity) and Chemical Composition.